Data analysis is the process of applying logical and analytical reasoning to study each component of data present in the system. 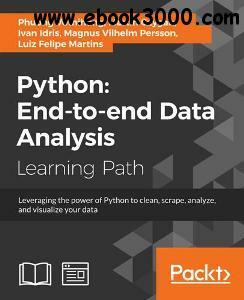 Python is a multi-domain, high-level, programming language that offers a range of tools and libraries suitable for all purposes, it has slowly evolved as one of the primary languages for data science. Have you ever imagined becoming an expert at effectively approaching data analysis problems, solving them, and extracting all of the available information from your data? If yes, look no further, this is the course you need! In this course, we will get you started with Python data analysis by introducing the basics of data analysis and supported Python libraries such as matplotlib, NumPy, and pandas. Create visualizations by choosing color maps, different shapes, sizes, and palettes then delve into statistical data analysis using distribution algorithms and correlations. You'll then find your way around different data and numerical problems, get to grips with Spark and HDFS, and set up migration scripts for web mining. You'll be able to quickly and accurately perform hands-on sorting, reduction, and subsequent analysis, and fully appreciate how data analysis methods can support business decision-making. Finally, you will delve into advanced techniques such as performing regression, quantifying cause and effect using Bayesian methods, and discovering how to use Python's tools for supervised machine learning. By the end of this course, you will have all the knowledge you need to analyze your data with varying complexity levels, and turn it into actionable insights.